LCD screen：3.0 TFT LCD,16:9,270 degrees rotation With Touching Screen. 1.SDHC card is EXCLUDED in the package and you need to purchase it separately. 2.We suggest kindly format the SD card in the camcorder before use. 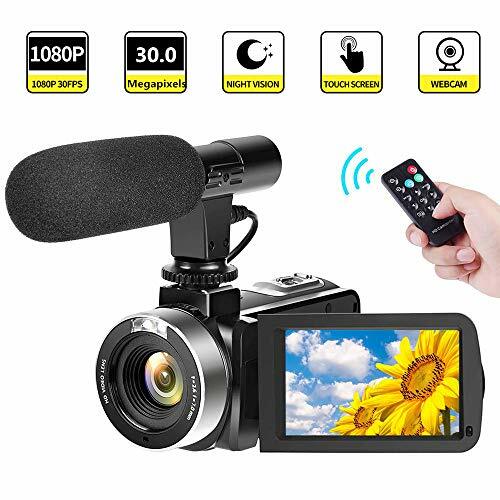 3.This cheap camera is designed for general daily recording or indoor and outdoor entertainment and not for special professional video audio recording. 4.When you used this cmacorder be a webcam, there is not support zooming, please kindly notice that. Camcorder Camera:The camcorder has multi-function,it supports 3.0″HD touch screen,pause function,recording while charging ,HDMI,internal Microphone and Speaker（record sound videos）,Date Stamp（set time and date）,Time-lapse video/photo,Slow motion video,Motion Detection video,Self-timer, continuous shooting(Camcorder is designed for Newcomer, not for Professional Users）. IR Night Vision Camcorder: The vlogging camera is equipped with IR LED light for night vision shot . You can easily turn on this function by clicking the power button. Therefore you can capture photos and videos in black and white while in low light situations. The youtebu camera has a gorgeous 3 inch screen for easy filming and playback. Web Cam&Recording While Charging:This is an easy to use camera for beginners. It supports live stream, so you can use it as webcam for video call on skype, whats app, face book and so on.The video camera comes with one 1500mAh 3.7V rechargeable batteries.You can record videos while charging, in this case, you can record long enough videos as you wish and no need to worry about battery drains. Accessories & Quality Assurance: A DV Bag (put the camera ), a Microphone, one Battery, a Power Adapter, a USB/HD Cable, a lens cover ,an English User’s Manual, a package (put all the accessories ). The camcorder supports storage external SD card (128GB at maximum, the SD card not included). COMI TECH video camera supports 1 month free replacement or refund, 1 year warranty. Please don’t hesitate to contact us if you have any questions.